Une image splendide, à la hauteur de l'Oeuvre. BV! WOW! That is some bridge! Love the moodiness of this image. Just the most subtle of light but enough! Brilliant composition and exposure Barbara. A marvelous point of view and a wonderfully moody image. Superbement effrayant ! Comme une évocation de la Liberté ! 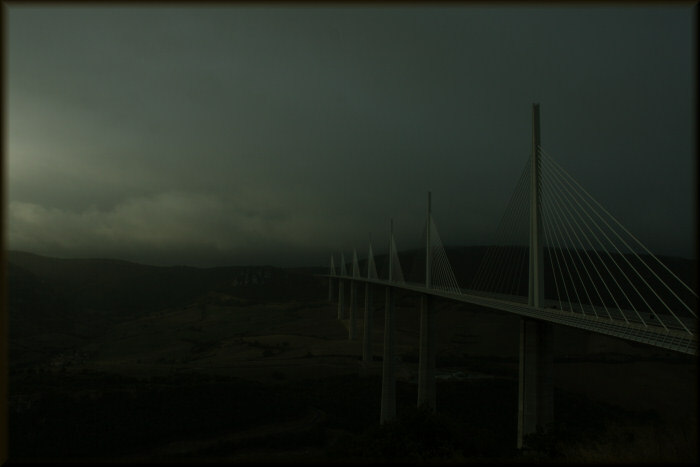 Les nuages, le temps et la lumiere sont directement sortis d'une toile classique et ce viaduc qui rappelle que c'est bien une photo et non une peinture. Damn, wish I'd seen this one before the other one! This one is even better. Subtle and strong. This seems like 'the bridge to nowhere'. There´s something in the darkness I can´t see. Not the bright side of life, but a great moody image. I'd love to see this bridge. This is rather a haunting image. wonderful perspective, Barbara. love the light and lines. excellent job.